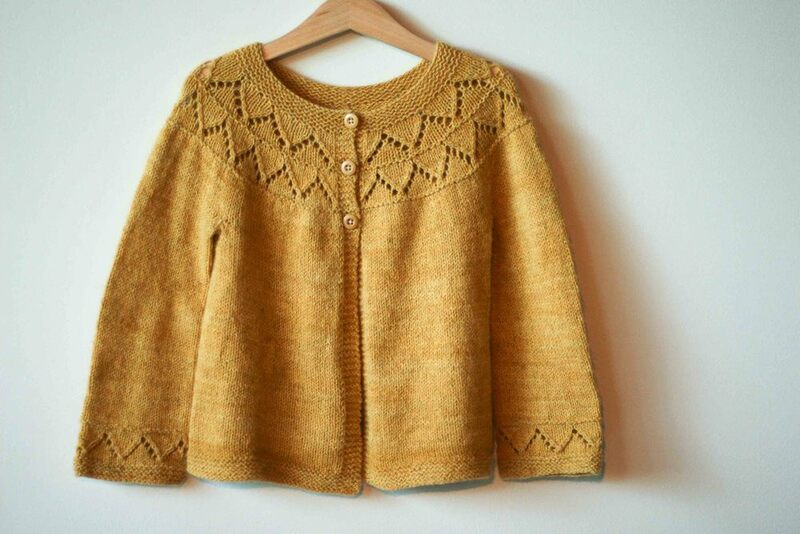 If you are Australian knitter on Ravelry you are sure to know of Georgie! Her Milo pattern (which she is teaching in the Intro to Seamless class) is an iconic pattern that has over 6000 gorgeous versions on Ravelry. It's iconic for a reason - a sweet and simple vest that is super fast to knit up and is keeping little bodies warm around the world. At the farmers market in Castlemaine a few weeks ago I saw two versions of Milo before I had even ordered my coffee. As well as writing gorgeous patterns, Georgie is also incredibly helpful and participates regularly in the forums answering people's knitting questions, and taking feedback. I recently made one of her latest pattern's Granny's Favourite (I love it so much I included a picture of it below!) and it is one of my all time favourite things I have ever ever made. The pattern is traditional and sweet but beautifully finished with gorgeous detail. What I really love about how Georgie writes patterns is that she is really thinking about how people read them. She tries to make patterns that give people plenty of information as well as opportunities to extend their knowledge. I'll hand over to Georgie now so we can hear a little bit about her history and process. Enjoy!! I honestly can remember a time when I didn't craft or make. I think I am really a product of my mother, who is one of the most talented crafters I know. She's sewn, knit, crocheted, quilted, made porcelain dolls and teddy bears, made lampshades and goodness knows what else. We were brought up in a household where that was normal, her crafting material was always in sight. I guess it just sort of seeps into your consciousness, and it seems more or less odd to not make. I've knit ever since I was really young. Knitting was my mum's time out at the end of the day, so I'm not sure that she ever really taught me or I taught myself from watching her. I suspect it was a bit of both! I used to have a little notebook with these patterns that I'd written for barbie doll clothes, and I'd knit them up for our barbies. I so wish I still had that notebook. I continued to knit as I got older, I don't think there was really ever a time when I didn't knit. I also dabbled in cross stitch and embroidery and spent a lot of time sewing. I love its portability. I can take my knitting anywhere and steal a few rows anywhere I am. I take my knitting everywhere either in my bag or bicycle basket, to swimming, to school pickup, to theatre lessons, in the car, to the park and the beach. I steal a few rows when I'm knitting dinner. I also love the flexibility and forgiving nature of knitting. No mistake or error is unfixable or can completely ruin your project. You just frog and redo. I used to sew a lot when the kids, particularly Lily, was really young. For a while I ran my own business which specialised in organic denim pants designed to fit over cloth nappies. Now, I barely get time to sew. The knitting is partly to blame, but I'm often just not at home.... and my machine won't fit in my bicycle basket unfortunately! Anyone who knows me well will know that process and routine aren't words you'd use to describe me. I steal time for craft whenever I can! I have a rule that I don't do housework (apart from the dinner duties) after midday, which supposedly means I have the afternoon to work amongst the kinder and school pickups and after school activities. Generally, I have a couple of hours in the afternoon three days a week where I do the business side of my craft; emails, pms, pattern writing. Each night after the little ones are in bed, I will usually knit. My youngest, Toby is a bit of a bedtime truant, so my window of opportunity there can vary greatly. My kids also love love love to craft. They are very imaginative and messy crafters so often when they get stuck into something they don't need any guidance, they like to follow their own ideas and don't want any outside help; and that gives me the chance to do my own thing. My version of Georgie's lovely pattern Granny's Favourite. I think it's pretty much the old stereotyped answer, everywhere! It might be stitch pattern books, vintage magazines, a garment, be it sewn or knit that I see on someone somewhere in public. It might even be a colour that sets of an idea or even the need for something purely on a functional basis. I like to challenge the conventions of structure, so often it might be me looking at the shaping of a jumper and thinking how could I do that differently, how could I challenge the way that's come about. Or maybe even just, how can I play around with idea to create something new and different. I don't think you could be a knitter and not mention Elizabeth Zimmermann. She really is responsible for bringing seamless knitting out of the dark. I love her relaxed approach to knitting and her willingness to challenge such long standing traditional conventions. Her Baby Surprise Jacket is pure genius! I learnt so much about design and construction initially from reading her books. My mum. Not only is she all-round talented crafter but she intuitively brought me up to believe that hand-made is special. I loved it when she knit jumpers for us as kids, I actually still have a couple of my favourites. She also made our deb dresses, which were all absolutely amazing. I remember even as a teenager, thinking how special those hand-made items were. I hope to teach my kids the same thing, I think it's really sad when crafters view their handiwork as inferior to bought mass-produced items; when they'll sew their child a dress but say it's just for around the house, it's not to be worn in public. My third one would have to be the previous owner of WOOLganics, Mel, as well as the new owner, Susannah. WOOLganics is an amazing yarn. It has everything I want in a yarn; organic, ever so soft, beautiful stitch definition, great colour range and it is a delight to work with. When people describe yarn as being like butter through your fingers, that's WOOLganics. It is an AMAZING effort that both these ladies have gone to to get such a company off the ground in Australia. We might be renowned for our fine merino but so much of it is shipped offshore for scouring and processing. I love the dedication of WOOLganics to produce such a sustainable product that is true to its origins. It's so important to work with good quality products, the best you can afford; whether it be needles, fabric or yarn. Check out Georgie's website here http://www.tikkiknits.com.